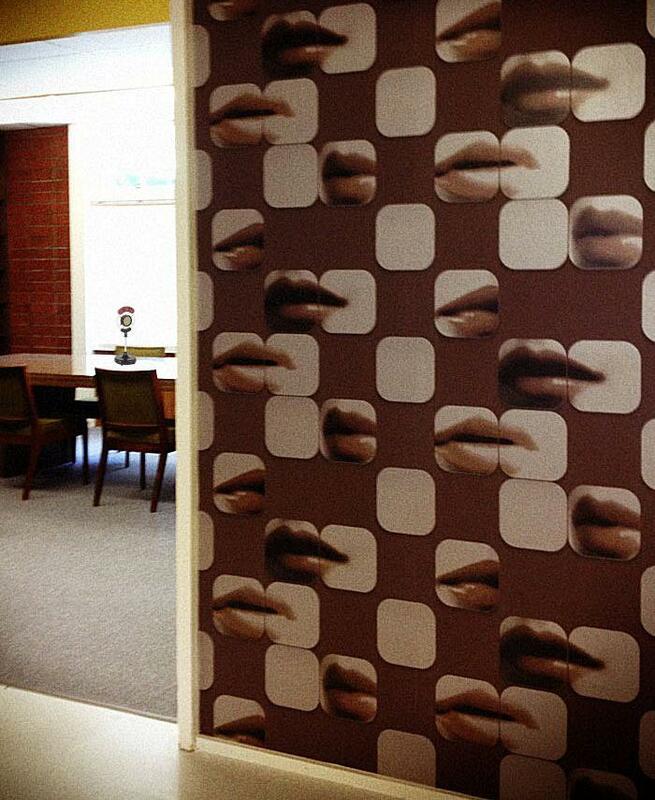 June, 2015... A copy editor with a background in marketing/PR writing, walks into WORK/Petaluma, a future-thinking co-working space and tosses two scripts onto the community table during a Tuesday morning, weekly, one-hour coffee social. In what would later prove to be one of those pivotal moments, she says, "My parents wrote these scripts for 'The Shadow' in 1944; perhaps you'd like to read 'em sometime." July, 2015... A techie entrepreneur who once developed visual technologies for DREAMWORKS and now devotes his waking moments to creating a fluidly searchable and lightning quick image database for professional photographers, takes a look at the scripts and decides to hold a friendly reading during co-worker Happy Hour on Friday afternoons. Among the other coworkers in the room on that Friday: a former Hollywood publicist/producer turned developmental book editor whose resume includes FOX, Universal Studios Florida, Paramount Pictures, and NBC. 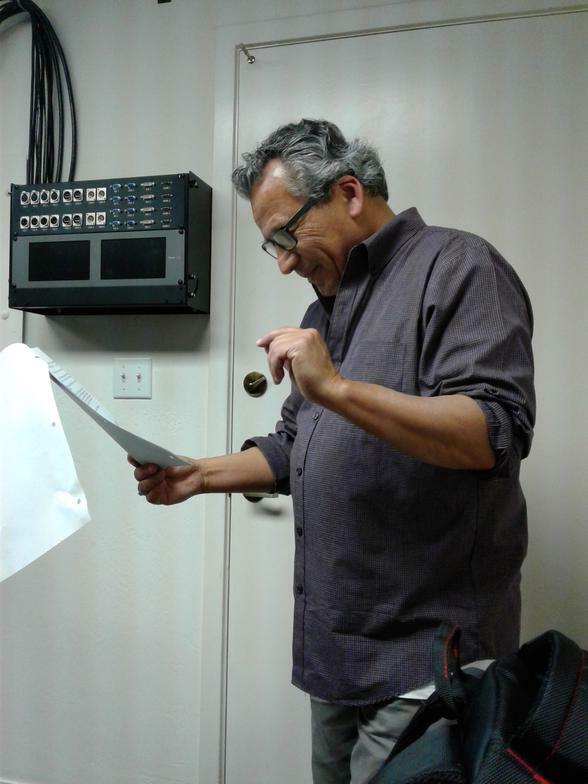 Within weeks, between a few litres and a few more litres of Sonoma County ports, craft beers, and Zinfandels, the producer concludes that the Library Room at WORK/Petaluma, while terrific for script readings, just ain't big enough to support what should be an audience of hundreds. So he calls up his friends on the Board of the Petaluma Trolley Living History Railway Museum (the guys and gals who are determined to restore vintage trolley service to Petaluma) and asks to borrow the small stage in their trolley barn. Meanwhile, the former DREAMWORKS techie comes up with a vintage radio logo and the producer comes up with a tag. 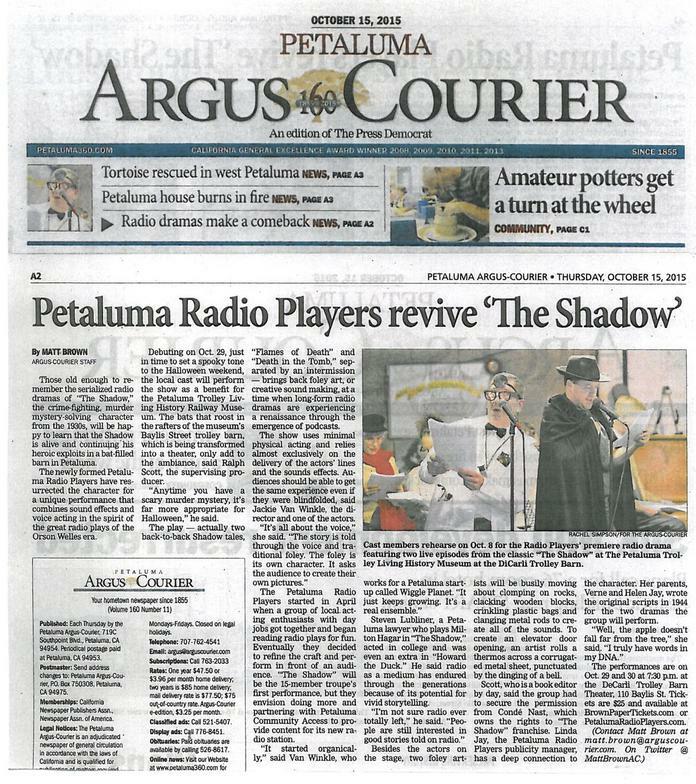 Within weeks, the Petaluma Radio Players are born. OCTOBER, 2015... After careful negotiations with CONDE-NAST in New York, one of the Troupe's actors who is also a lawyer secures permission to stage both half-hour episodes of 'THE SHADOW' from the two scripts written in 1944. 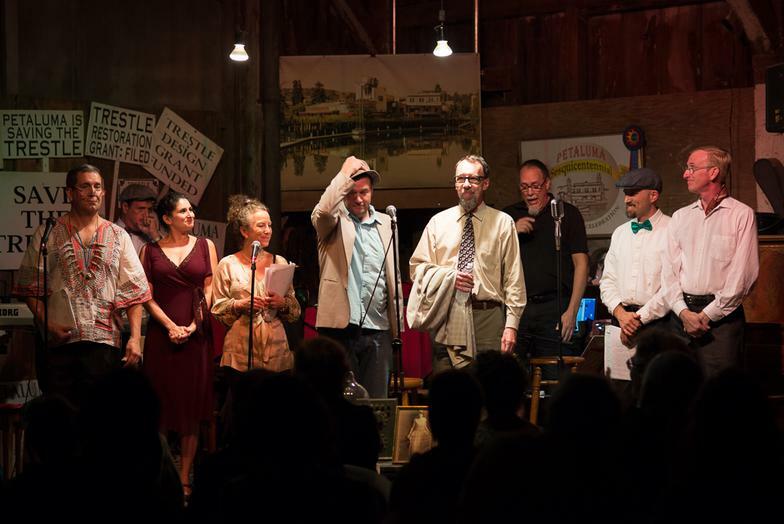 The Troupe plays to two nights of standing room only audiences seated amidst dusty railcar parts, old upright pianos, vintage photographs and rail maps from the glory days of the P&S.R. (the Petaluma & Santa Rosa Railroad), and, yes, under a squadron of fruit bats and mice enjoying the show from the rafters. The week before the show debuts on stage, the Petaluma Argus-Courier breaks a feature story about the Bay Area's new radio theatre troupe. 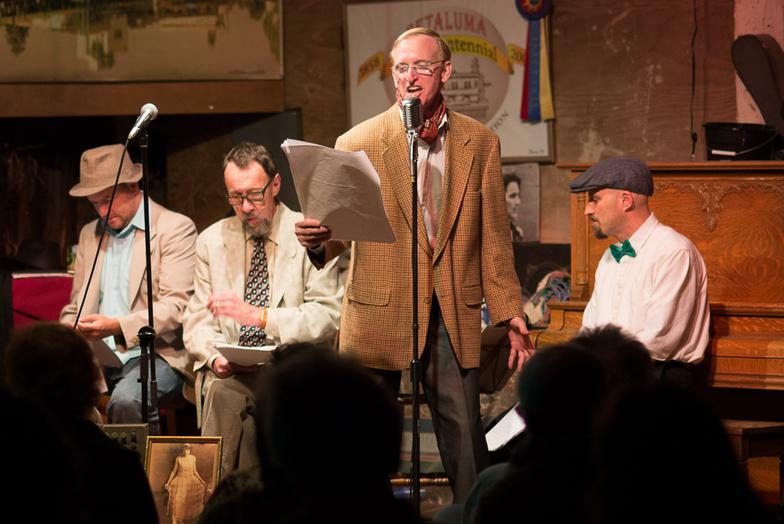 JANUARY, 2016...Holding the first official meeting of the New Year, the fledgling Petaluma Radio Players embark on an ambitious program to record a play a month. Only one problem. Where to record their plays? Oh, and only one other problem: Who's going to hear the recordings once they do? 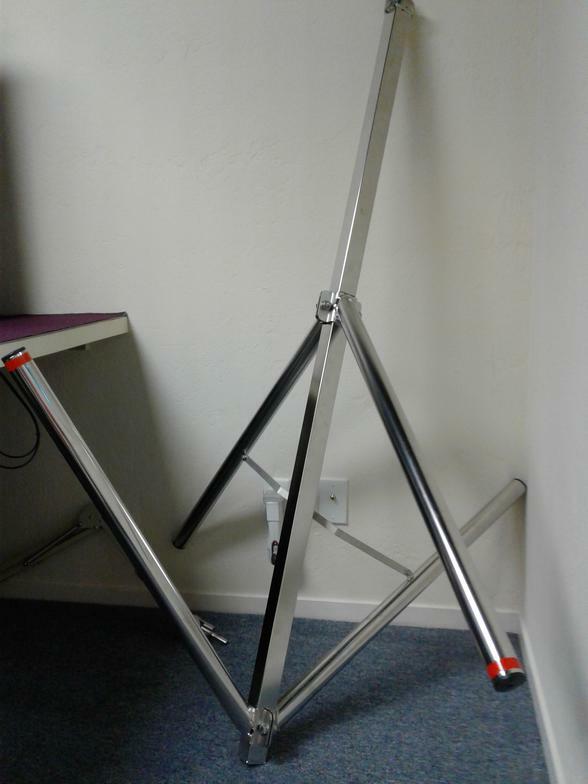 Around the same time, and only a few blocks away from the Library Room at WORK/Petaluma where P.R.P. 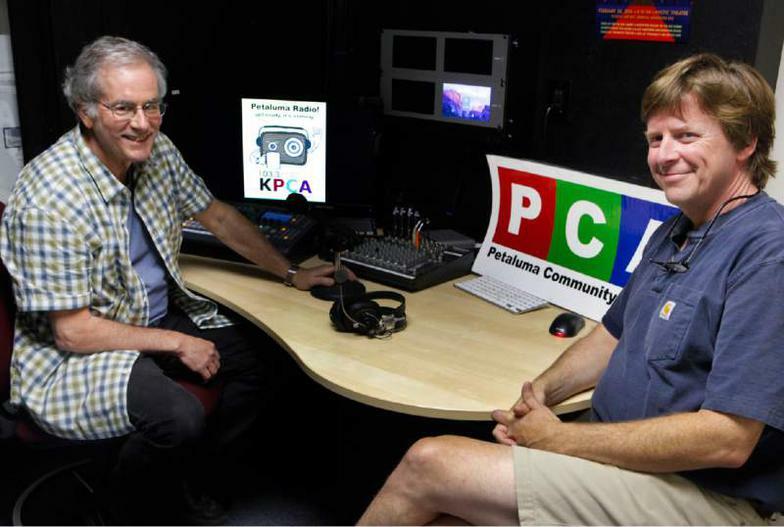 holds the Troupe's Thursday night meetings (only now with a lot less port and Zin), Petaluma Community Access (PCA-TV) decides to launch the first radio station in Petaluma in half a century: kpca-fm (103.3). Ah, but another problem: where would they put the transmitter? Hundreds of site studies eventually led PCA to the top of the Santa Rosa JC's Petaluma campus on the East Side of Petaluma. Seemed like the perfect spot to reach east and west side residents and a bit of downtown besides. 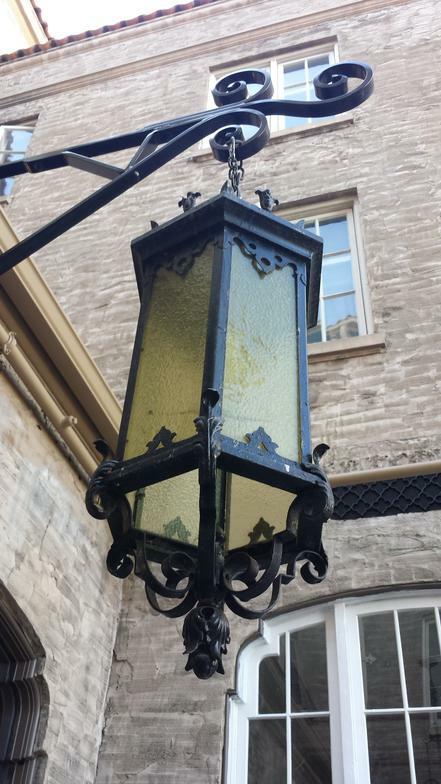 The signal, once the station debuted, would serendipitously carry right over the Trolley Barn where P.R.P. held its first live show: The Shadow. After meeting with PCA's president and the outreach director, PCA invites the Petaluma Radio Players to record their shows at PCA's humble 15'x10' TV studio in the back of their offices across from the historic Hotel Petaluma. The Troupe records its first show that month. And continued to record shows once a month, tapping plays from online catalogs of vintage stage and radio plays all in the public domain. Among the titles they took from page to digital files: 'TRIFLES,' a murder mystery-turned-social commentary by turn-of-the-last-century female playwright, Susan Glaspell; 'FOURTEEN,' a 1920's comedy that finds a society woman and her debutante daughter and butler resetting the table every three minutes as a stream of guests frightened by a winter storm, or motivated by the loneliness it inspires, call to cancel or accept an invitation to dinner. 'THE NOIR BEFORE CHRISTMAS,' a new take on a classic story, by Bay Area playwright Steven Lubliner, where gangsters lament the arrival of old Saint Nick who packs more in that sleigh than a few thousand toys (unless Tommy Guns are considered toys), and 'SELDOM SEEN, NEVER HEARD,' written by a Maryland inmate-turned-playwright who pens his characters from the confines of his cell. The recorded raw material would be uploaded to the Troupe's Dropbox account, and downloaded and turned into beautiful, high-production value works of radio art by the P.R.P. 's Austin, Texas-based post-production supervisor. The final works, uploaded to the P.R.P. 'PODCAST' (petalumaradioplayers.com), were available for all the world to hear. But then there was that problem that continued to dog P.R.P. : How could the Petaluma Radio Players honestly call themselves 'Radio' players when they still weren't broadcasting on radio? PCA was locked in negotiations with the Santa Rosa Junior College and with the FCC to ensure that kpca-fm would receive four (4) days/nights of programming leaving the balance for the J.C., but like with all new ventures, especially those where the local public sector meets the Feds, things take time. More than a year's worth of time. 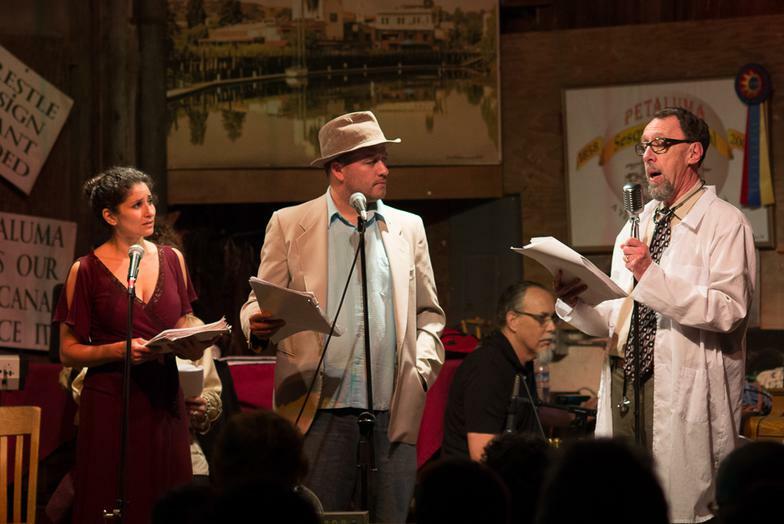 With each promise ("The transmitter goes up in November...." "The transmitter goes up in March...."), the Troupe wondered if their shows would ever find an audience in their own backyard. Undaunted, they continued to record 'radio' plays. Deciding that bats and choking dust and old railcar parts (and frigid air) made for simply wicked ambience, but restrictive fire codes that put a 50-person cap on participation made for too small an audience, the Petaluma Radio Players abandoned the Trolley Barn and instead met and struck a deal with Hotel Petaluma. The hotel, an iconic North Bay landmark erected in 1923, that was still in the throes of a massive, four-year, top down restoration, agreed to provide the beautiful and stately 'Goldman Ballroom' with a seating / standing capacity of 150-230. 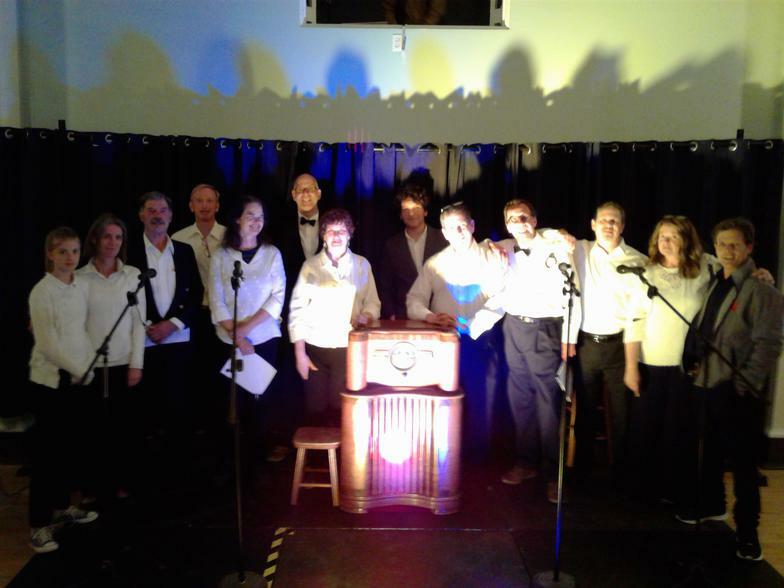 On December 8th and 9th, the Troupe assembled four plays all with a mystery theme and all comedies and staged 'SLAY BELLS RING (Are you listening?)' to two nights of sell-out houses. The plays: Playing with Knives, by Natasha Yim; The Railroad Detectives, by Kate Crockett Juliana; The Noir Before Christmas by P.R.P. troupe member, Steven Lubliner; and A Murdered Mystery, by Karl Garner. The latter play, where the actors fight to stay in character as they internally battle over who is the most important character, all but sidelining the mystery of who killed the victim, was an 11th-hour substitute less than a week out from opening night. (The Troupe decided that 'TRIFLES,' a 1916 gender issue murder drama they'd previously recorded in studio, was too dark for an evening of murder and mayhem most humorous.) 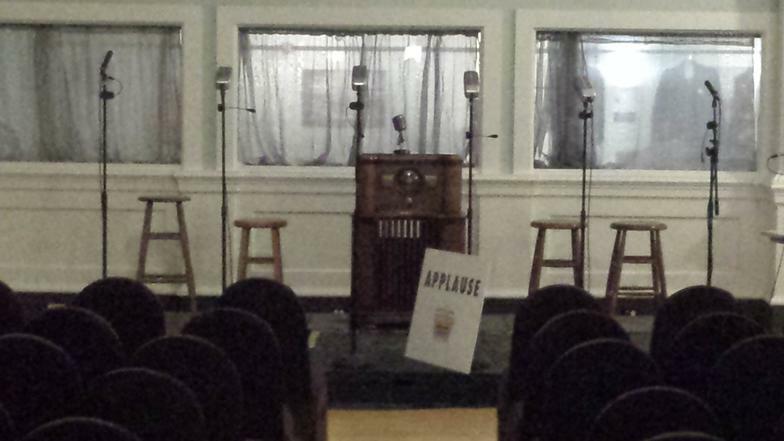 Pre-performance funds tight, but eager to put on a vintage radio show in the traditional style, complete with live sound effects provided by a two-man team of Foley Artists, P.R.P. retained the services of a co-worker at WORK/Petaluma who owned, managed, and housed a 3D Printer at the coworking space. Within a few days, all four standard studio microphones were outfitted with silver spray-painted plastic 'Shure' radio mic covers more often associated with Bing and Sinatra than rado theatre in the new Millennium. The auditorium was designed with three large windows on the upstage wall and three smaller windows, connoting Romeo and Juliet higher above. The 12-piece, black wooden risers, creating a limited stage area of less than 12 x 15 feet, were provided compliments of The Petaluma Shakespeare Theatre. 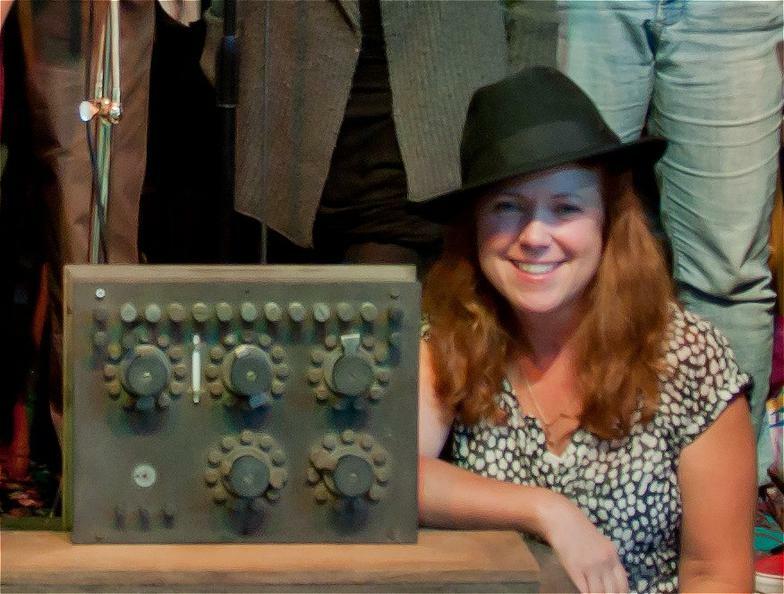 The 1940 Zenith cabinet radio was pulled out of storage at the Trolley Barn. But where would the Troupe put Iain, the UK announcer in black tie? 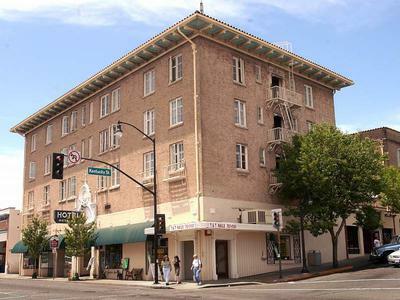 That was solved by the Assistant Manager of Hotel Petaluma: "Why not stick him up there?" 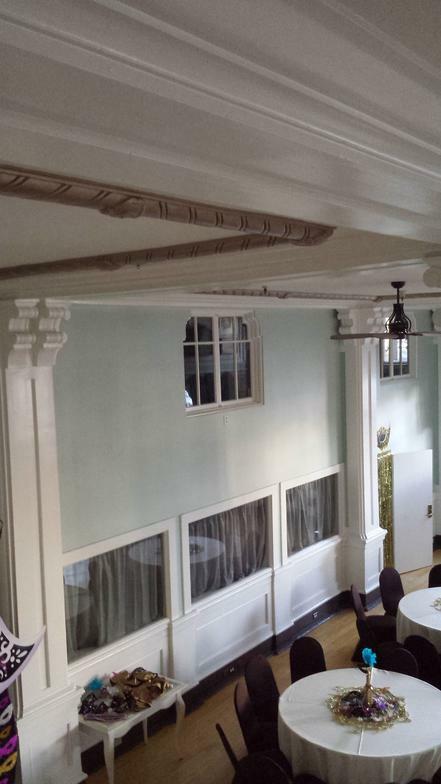 He pointed to the upper center window. The producer loved it and seized the opportunity even if it meant the Emcee had to spend the entire show in a window. When hit with a spot, along with the Zenith's round glowing dial on the stage down below, the stage design instantly set Slay Bells Ring apart from any radio show in the history of radio theatre. The audience was enamored. And mesmerized by...the Foley guys. If you closed your eyes, you'd've sworn you heard a 1930s Pullman pulling out of the station heading up the northeast corridor for Newport. Open your eyes and behold the man spinning quarter-turns of the two-foot cylindrical cage loaded with numbered golf balls, a relic from a long ago Bingo meet borrowed from the Petaluma Trolley Living History Railway Museum. 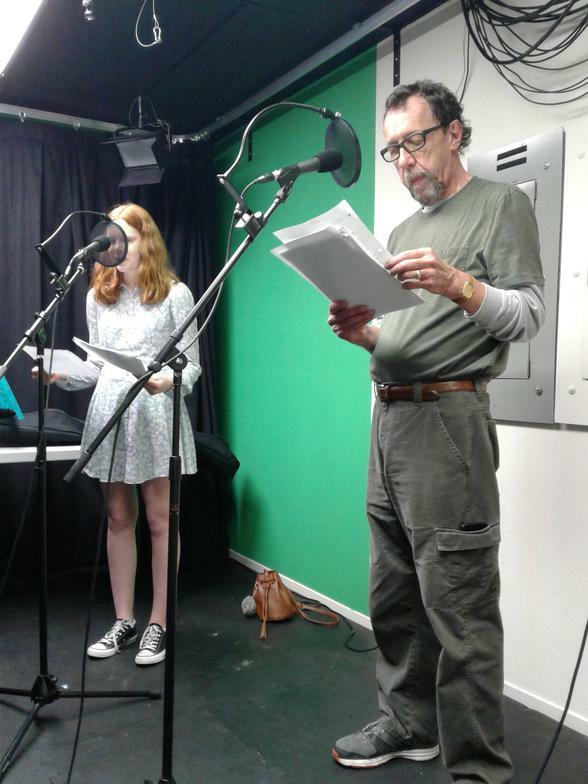 The new year opened with 15 recorded plays in the can...but still no broadcast. 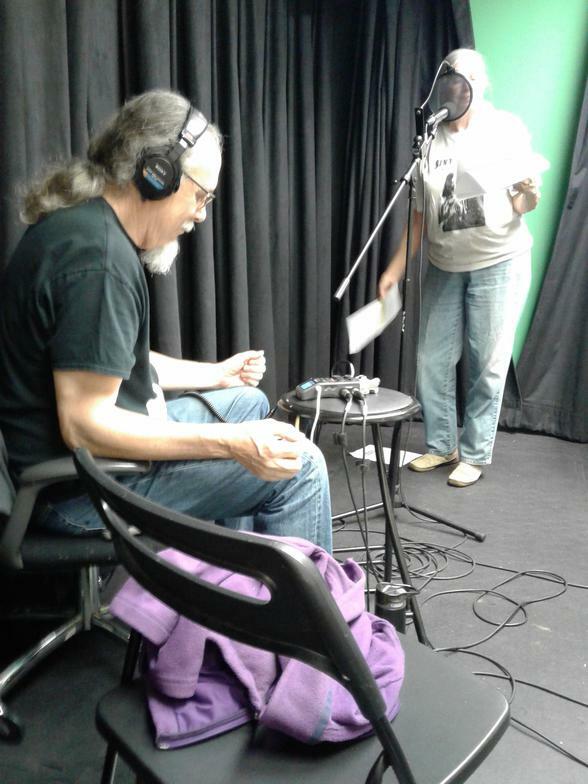 Meanwhile, fledgling radio station, kpca-fm (103.3) held a soft open in or about March. To test its reach, the station dispatched an engineer to drive around Sonoma County. To the station's surprise, the signal beaming out from atop the SRJC on the East Side of Petaluma, which was only anticipated to reach downtown, broadcast clear to the West all the way to Bodega and to the East, all the way to Sonoma, all in the reach of potentially hundreds of thousands of prospective listeners. And then the call came. A little more than 8 months into 2017, during a Thursday night meeting in August, the Petaluma Radio Players, now a 501(c) 3 in development, with a three-member Board of Directors and 20+ member Troupe, were joined by the son of the P.R.P. Board president. An audio engineer who was hosting his own alternative music show, the host was also on the Board of Petaluma Community Access (PCA). The Troupe begged him: Please secure us a timeslot. "We want Thursday night, 9:30 but we'll take whatever you can give us." -- "How about Tuesday night? Will you take that?" "YES!" The Troupe was unanimous. On August 1st, Tuesday, 7 p.m. Pacific, amidst a few mid-priced bottles of Korbel, a container of chocolate chip cookies from Petaluma Market, the Petaluma Radio Players gathered around the lobby of kpca-fm and popped corks on their first broadcast: The Man in the Photograph: An Ivory Pointer Mystery and Story: A Detective Story. Mysteries and comedies. But it's no mystery how we got here, though there's been a lot of laughter along the way. from 'The Misadventures of Sherlock Holmes' series will appear in the publisher's catalog for download and purchase of four-CD sets.